"Fueled by passion at an early age..."
The idea of Classic Hammonds® was conceived many years ago in 1979, approximately 5 years after the Hammond Organ Company ceased production of its Tone Wheel Organs. At that time, Classic Hammonds'® entrepreneur, Steven Roady, the 2nd oldest of 5 siblings, was 26 years old. 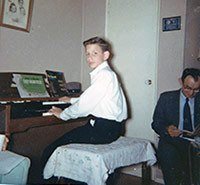 He was self taught on the organ and had been playing since in the 2nd grade. While Steven's classmates were all enjoying the whiles of daily recess, this 4-1/2 foot tall grade schooler spent his time mastering the intimidating Reuter pipe organ at his parish church. "Will Mrs. Roady please come to customer service?" Back in the day, Steven's mom made a bi-weekly trip on Thursday evenings, to take her mother, Grandma Fasl, to her favorite store, Sears, Roebuck® and Company on the Country Club Plaza. You see, that was traditionally the only night that retail stores stayed open late. When Steven discovered that Sears sold organs, this field trip quickly became his highest priority. On the night that Steven discovered the organs, he had wondered off from the pack to lead his own expedition. His trek brought him to the 3rd floor where the Silvertone organs were on display. He immediately sat down at the one he perceived to be the flagship model. Without asking anyone, he powered it up, and began to tickle the keys. The dazzled sales people quickly gathered around to hear this youngster make this console seem alive. It only took about 30 minutes of fun before one of the dazzlers asked Steven where his parents where. Steven replied, "Oh, my mom is shopping with my grandma." The salesman then asked Steven his name. The salesman told Steven that his mom just may be looking for him, then took him by the hand to the customer service area. Meanwhile, as suspected, mom had discovered his absence and the troops had begun a search and rescue operation. Back at the customer service area, the salesman told Steven to have a seat. While sitting, Steven heard something over the P.A. system that caught his attention. "Will Mrs. Roady please come to customer service? Mrs. Roady to customer service!" When the troops embarked upon the customer service area, Steven's mom ran over to him. She grabbed him and hugged him like she had not seen him for years. The salesman explained how Steven was teaching them how to play their organ. She thanked him several times. The gentleman told Steven's mom that he was welcome to come to the "3rd floor" any time she would allow it. From then on, every other Thursday evening, when the Roady's infiltrated the Sears store, mom had a standard line she recited to her son, "Stay in the organ area until I come to get you." And being the obedient child he was, Steven never disobeyed. 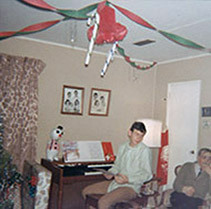 It was not until 1963, while in 5th grade, that Steven finally convinced his parents the he was serious about playing the organ. On that Saturday, Steven dragged his mother, Bernadine, to Jenkins Music Company in Downtown, Kansas City, Missouri, where she wielded her creativity to purchase a Lowrey Starlet Deluxe. Although Steven had his eye on the Hammond M-3, the family of seven's budget was doing well to afford the Lowrey. Steven was so ecstatic and thankful that he forgot about the M-3, for now. After all, any organ that was going to reside at the modest Kansas City, Kansas home was indeed cause for a victory celebration. Many years later, Steven recalled his mom reminding him of a remark he had made to her in the elevator that day, while descending to the Lobby. "Hey mom, did you know the Starlet Deluxe even has a built-in Leslie?" Barely knowing what Starlet Deluxe meant, and definitely not knowing what a Leslie was, she just smiled at him while admiring his exuberance! Steven and his mom, along with every brochure & piece of literature about the Starlet Deluxe, departed the Jenkins 6th floor showroom for home. The delivery was set for the following Tuesday, just shy of 2 light years away in his mind. The delicious anticipation of having his very own organ, after more than 3 years of daily dreaming and begging, was almost torture. Steven recalled his school days and thought the clock seemed to move faster even when waiting for the bell to ring signaling that class was dismissed. On Tuesday, at 2:05PM, the truck squeaked up in front of the Roady house, like an early morning alarm clock. It was their final stop of the day. Steven had convinced his wonderfully empathetic mom that his presence was absolutely mandatory at delivery. Mom's compassionate nature allowed him stay home from school that day. Steven's dad recalls that upon his daily 4:00PM arrival home from the steel plant, he was met by "something extremely loud" that ensued from the opened windows of the non air conditioned house. 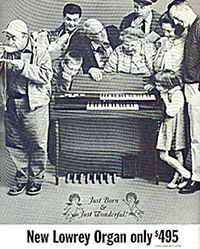 As Dad dropped anchor and exited "Blue Ribbon Special", the family's beloved, non air-conditioned 1963 Impala station wagon, little did he know that his son had dual-handedly mastered the over 45 songs in the 3 Lowery music books that accompanied the organ, and had caused the family's Labrador retriever to seek shelter in the back yard. 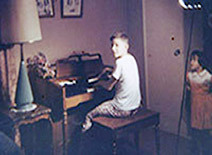 For nearly 5 years, Steven rode the bus every Saturday afternoon to Jenkins Music Company to be tutored by Zena Kearney. Zena's studio boasted the revered and infamous B-3. While Zena's creed was "to instruct the student on an instrument that is similar to the student's own instrument", Steven had made her aware of his testimony to the "Hammond" sound on numerous occasions. While receiving instructions each week on Zena's Lowrey Heritage Deluxe, he never missed a chance to sneak a close-up of the machine that he dreamed of owning someday. Steven played at numerous recitals and concerts held at Jenkins throughout his instruction, always on a "Lowrey". And with mom's 8 brothers and sisters, someone was always ringing the phone to see if he would play at a wedding, graduation, party or whatever. But the surprise of his life came in November, 1970, on his 18th birthday, when Zena Kearney fulfilled one of his lifelong dreams. For the concert that was scheduled that day, Steven was told he was going to play the Lowrey Lincolnwood console that was stage left of the Hammond B-3. The Hammond sat silent and patient while several of Zena's younger students strutted the Lincolnwood's stuff! But when Zena announced "Steven Roady at the Hammond B-3", he was so stunned that he nearly forgot to get up from his seat so that he could embark upon the instrument that was beckoning him. "The want in life is the key"
Steven recalls the inspiring words from one of his life mentors, "The intensity of the desire decreases the time spent to achieve the desire". Hence, the want is the key. Steven finally achieved his dream on April 25, 1974 when he was able to purchase a Hammond B-3, accompanied by two Leslie 122's, from The Toon Shop, in Prairie Village, Kansas. He recalls that there was only one other day in his life that produced the exuberance felt on this occasion; The day he bought his 1971 Cowl Inducted, Chevelle SS454 sport coupe. Little did he know that within a year The Hammond Organ Company would cease production of its Tone Wheel Organs. 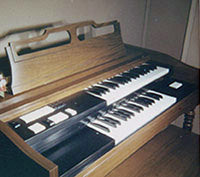 "A truly mint condition Hammond B-3 & Leslie 122, 35-55 years later..."
In 1979, 5 years after Hammond quit production of the Tone Wheel Organs, Steven had a revelation that someday B-3's might be in danger of extinction. He recalls that his new dream was to someday be able to restore Hammond's precious instruments to the original state and condition at their birth. Accordingly, Steven's idea that in the years to come, a mint condition or collectable quality Hammond B-3 would be a highly sought after item, became a reality. Steven recalls that he thought they should be called "Classic Hammonds®". In 1999, Steven decided it was time to launch and bought the 1st B-3 to begin the exquisite rebirth process. During that period, working in all his spare time, Steven was able to produce 1-2 of these marvels a year. As time progressed, he knew that this was the final venture of his life. The passion and love for these remarkable noise making machines had infected him a very long time ago. He had arrived. The exhaustive man hours and relentless pursuit of perfection to produce the "Mint Condition and Collectable" B-3 are exhibited in the exquisite results, unprecedented by which only a very few are privileged to wear the Classic Hammonds® badge.